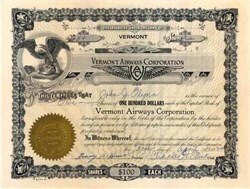 Beautifully engraved Rare certificate from the Vermont Airways Corporation issued in 1929. 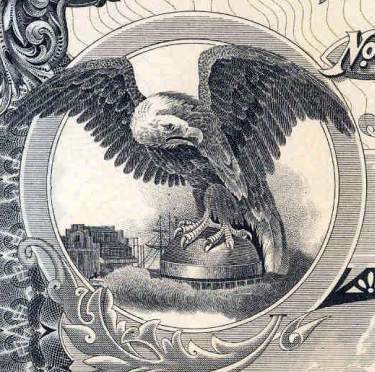 This historic document was printed by Goes Lithograph and has an ornate border around it with a vignette of an eagle perched upon a rounded building and the company's name and logo. This item is hand signed by the Company's President ( Framy Hums ? ) and Clerk ( Charles H. Flint ) and is over 74 years old. This is the first time we have seen this certificate. The Vermont Airways Corporation was organized in 1928, and was the first commercial airline company in the state of Vermont.